RTRmobile provides a simple, flexible and elegant solution for rating video/audio material. But other life performances (performances, lectures, presentations, etc.) can be evaluated in real time. In contrast to our other tools (RTRonline and RTReval), all participants in the study evaluate both simultaneously and synchronously with the presentation. The input device is a personal iOS or Android device. The RTRmobile app allows you to operate a virtual slider via touch screen. The interface is intuitive to use and provides good orientation on the rating scale. 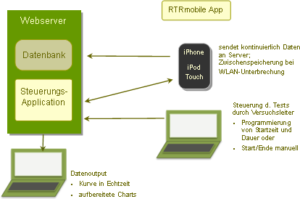 The data transmission takes place via WIFI or mobile network and is recorded by a web server. The test lead controls the data collection live from anywhere via a web-based control panel. The judgments of the registered handheld panels can be viewed online in aggregate form (e.g., as the average of all participants) from any location. You decide whether you want to continue working with the raw data yourself or if you would like to use our data processing services. We deliver trajectories – grouped to your liking – in the format of your choice. For quick access to the RTRonline curves as well as the detailed course analysis, we offer RTR click & show, a tool that is used to call up the corresponding section of the video online when clicking on the curve.